And we are back with another post about a zoid, readers! Technically, we will be discussing two different “mechanical combat units” today. They are both the same “species” and probably count as the same zoid, just with different color schemes. Visually, that appears to be the only substantial distinction between them. Today’s subjects are the Styraccosaurus-type Dark Horns and Red Horns. Used by the Imperial Army, Dark Horns and Red Horns are the zoids piloted by anyone holding the rank of Lieutenant on up. They are not infantry creatures; you get to use them only when you move up in the ranks. The cockpits for both zoids are in their heads, under those glowing green eyes. They can be outfitted with almost any type of arsenal, from machine guns to missile launchers to the trademark three-barrel cannon on their backs. They also have smaller guns attached to their chins, shoulders, and hips, along with radar equipment. While not exactly fixed weapons, Dark Horns and Red Horns weigh a lot and are therefore relatively slow when compared to other zoids. The fact that they are so low to the ground doesn’t help, either. 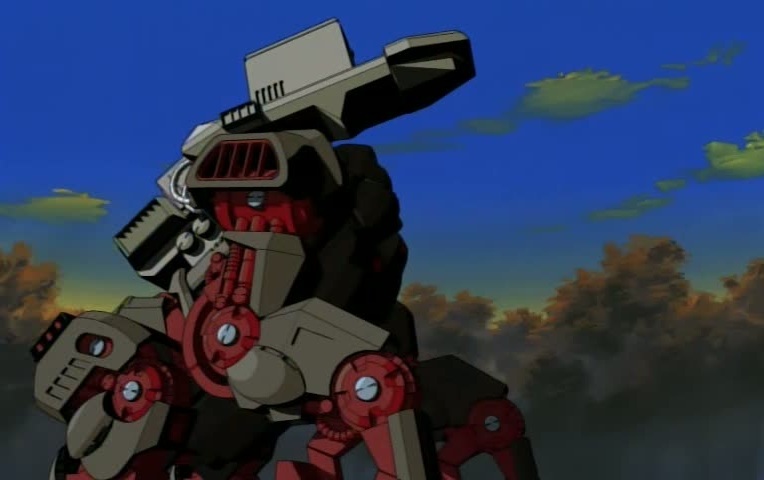 Nevertheless, Harry Champ from Zoids: New Century Zero was able to reduce his Dark Horn’s turning radius and increase its speed with boosters he had installed in the zoid’s hips. But those were eventually fried because he over relied on them during his battle with the Blitz Team. That’s really not surprising, since the guy had more money than brains and generally couldn’t find his way in out of the rain unless you pointed him in the right direction. But it did prove that the Dark Horn and the Red Horn can have their speed increased. Most pilots do not go in for such drastic modifications, probably because they can’t afford them. We never saw this device used by the Imperial Army, which means the boosters either were not available in this time period on Zi, or they were too expensive to be bought and installed en masse. Either explanation works. The only time I ever saw a Dark Horn piloted well was in Chaotic Century. In the episode “Raven,” Van’s old nemesis gets his hands on a Dark Horn and uses it effectively against our hero and his friend, a Lieutenant in the Imperial Army (more about him later). Raven was able to catch a Dibison’s chin on the Dark Horn’s nose horn and, using the other zoid’s momentum and weight, roll it onto its side. He was also able to make the Dark Horn leap over Van’s Blade Liger while the other was running toward him. So the Dark Horn it capable of quite a lot. Most pilots, however, are utterly incapable of getting such amazing results from it. We didn’t see too many Imperial Red Horns during Chaotic Century’s run. The one I remember best is the Red Horn Rosso piloted before upgrading to an Iron Kong. Rosso achieved his full potential as a pilot in a Storm Sworder, although he piloted his Iron Kong with special skill. In contrast to that, his ability with the Red Horn is nothing to write home about…. …Except for the fact that it hints at his growing talent. While we don’t see Rosso do much more than shoot and charge in his Red Horn, it is never implied that he is a lightweight in combat. Looking at the picture of him below, you would think that was obvious; Rosso is not a shrimp by any stretch of the imagination. But that doesn’t mean he was, is, or will be a good pilot. “Size matters not” in the cockpit of a zoid; as long as you can reach the controls and work the pedals, you can pilot the zoid you are sitting in. 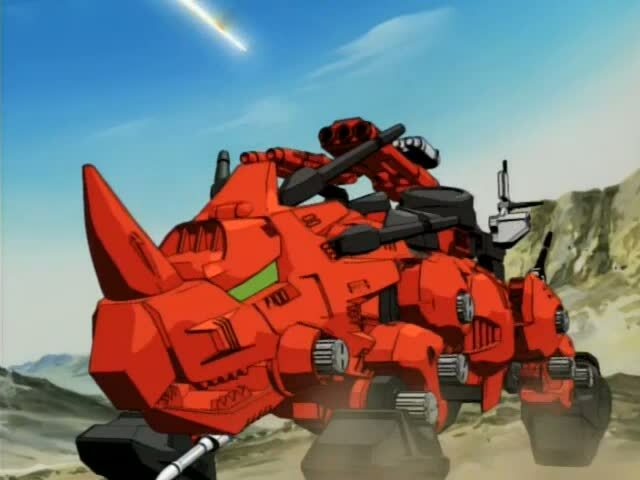 The last time I can recall hearing about a Red Horn was in Zoids: Fuzors. It appeared briefly during an arena battle, and its nose horn had been modified to act like Liger Zero’s Strike Laser Claw Attack. When activated, the forward part of the nose horn would glow yellow, charged with energy so it could slice through an enemy zoid’s armor. It seems like a rather ridiculous modification to me; the Red Horn’s and Dark Horn’s best assets have always been in the tip of the nose horn in my opinion. Having the front part of the horn slice through an enemy isn’t overkill so much as it is… Stupid. All in all, Dark Horns and Red Horns were pretty effective tanks. Slow though they were, they could deliver in terms of fire and ramming power. Again, predator-style zoids are more my thing, but I don’t recall thinking Dark Horns and Red Horns were silly “mechanical combat units” to take into combat. They could be deadly when used properly, and their arsenal was never anything to scoff at, readers. Well, that’s it for now. I have one more Zoids post coming up, and then we will all take a break before I do any more. You won’t see those zoids posts for a while, but they will be comin’ round the mountain, don’t you worry. This entry was posted in Spotlight!, TV Shows and tagged children's animated tv shows, Dark Horn, Guylos Empire, Japanese Anime, Japanese cartoons, Japanese TV Series, Japanese TV Shows, Red Horn, Rosso, Spotlight!, TV series, TV Shows, Zoids, Zoids: Chaotic Century, Zoids: Fuzors, Zoids: Genesis, Zoids: New Century Zero on June 22, 2018 by The Mithril Guardian. Here we are “in the far reaches of the Milky Way” galaxy again, readers! Today’s post is about one of the most amazing zoids on Zi – the Lightning Saix! Why is this zoid so special? Look at the video below before you take my word for it! 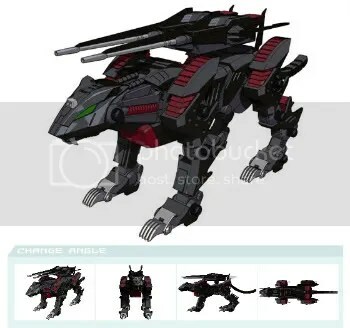 Is this zoid cool or what?! The Lightning Saix is a high speed, high performance zoid built by the Guylos Empire in Zoids: Chaotic Century. Capable of reaching 305 kilometers per hour (202 miles per hour), the Lightning Saix’s intense speed is really tough on the pilot’s body. The first pilot for the prototype Saix passed out during a demonstration of the zoid’s abilities. And that was with a buffer installed that powered down the Saix to keep it from going as fast as it could run! Based on the cheetah, the Lightning Saix’s bare capabilities are on par with those of the Republican Command Wolf. However, the Saix is much faster and more dexterous. Its lithe frame and agility make it an excellent close combat zoid, able to hit an opponent and dodge away before the other zoid and pilot can retaliate. The only zoid which can “dance” with a Lightning Saix is a Storm Sworder. While the Storm Sworder is flying at Mach 3.2, it outstrips the Saix. But if the two zoids get into close combat when the Sworder is flying at lower speeds, you are in for one spectacular supersonic battle! The Saix, like the cheetah, has claws which do not fully retract. Once the zoid is ready to run, the claws extend. They are sharp, able to cut through the light armor of smaller zoids or the stronger armor of intermediately outfitted opponents. The Saix’s teeth are also able to pierce the lighter “skin” of other zoids. The Lightning Saix is not a brawny creature. Just like a cheetah, its best asset is its speed. It cannot wrestle in the dirt like a Blade Liger. That would be disastrous for it. The Saix is best piloted by someone who can shoot from a distance and who knows how to strike hard and fast, then run like lightning to get away. Obviously, though, the zoid is armed. You cannot fail to see the double barrel cannon on the Saix’s back, readers. This is a Vulcan laser gun. It is very effective on lightly armored zoids, or “combat units” with somewhat thicker armor. But the Saix will definitely not be competing in the Highest Yield Explosive Shells Competition. The lasers, like the zoid, are meant for quick-strike fighting. If you need more weight and strength during a battle, then you are going to need something other than a Lightning Saix. The Lightning Saix is a very fast zoid. It can cross land faster than any other “mechanical combat unit.” The only land zoids which have been modified to keep up with a Saix (to the best of my knowledge) are the Blade Liger and the Liger Zero. In Zoids: Chaotic Century, Van Flyheight’s Blade Liger underwent some booster modifications which allowed it to keep pace with the Lightning Saix. 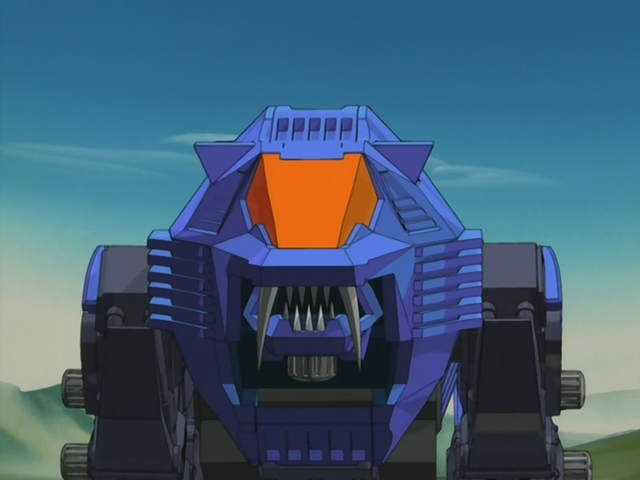 In Zoids: New Century Zero, the Liger Zero had a set of blue armor, called the Jaeger (or ‘Hunter’) armor, which allowed the zoid to travel at the same speed as the Lightning Saix. This armor was not the Liger Zero’s primary or “basic unit” armor. The Liger Zero’s armor can be changed, allowing the Liger to achieve certain characteristics in combat against specific opponents. The Jaeger armor was one of those three ‘special suits,’ as it were. There is one last thing you must know about this zoid, readers. One last secret talent of the Lightning Saix. When traveling at speed, the Saix is impossible for most other land zoids to catch. This is when military bases deploy their anti-zoid measures – missiles that will home in on the zoid and destroy it before it can escape the perimeter of the base from which the missiles were fired. When these missiles are fired at the Saix, the zoid is usually going at a lower speed. It gives the missiles just enough rope to hang themselves. Then it kicks into a higher gear, going faster than the missiles. The zoid also activates some holographic technology and systems embedded in its body. Combining the holographic tech with its high speed, the Saix is then able to create the illusion that it has abruptly vanished. As you can imagine, this does not go over well with the missiles. They were chasing a target one minute, the next, it disappeared from their radar. The computers in the missiles freeze up as they try to figure this puzzle out. This means the missiles fly skyward in confusion, where they overload and blow up as their computers fry, unable to process their target’s disappearance. Anti-zoid missiles fired from other zoids have a similar reaction, usually. Once the missiles are gone, the Saix lowers its speed and turns off the holo emitters. Abracadabra, allacazam, and hey, presto! – the Lightning Saix is back in plain view for everyone to see! Talk about “catch me if you can,” huh, readers? Most models of the zoid have green eyes, under which their single-seat cockpit is positioned. The one notable exception is Irvine’s Lightning Saix in Zoids: Chaotic Century. But I am not telling you why his Saix had orange eyes. You will have to find that out for yourselves! As a last note, Irvine was the first pilot for a Lightning Saix in Chaotic Century. In Zoids: New Century Zero, we had three Lightning Saix pilots. Jack Cisco was the first Saix pilot the Blitz Team encountered. He later formed a team of the cheetah-type zoids, adding the sisters Chris and Kelly to back him up in the prize fights. They named their squad, rightly enough, the Lightning Team. The three also demonstrated a new tactic in the battles they participated in. Jack led the charge and the sisters fell in line behind him, allowing them to build up more speed as they stayed in his draft. This tactic was very effective the first time around, allowing Cisco and the sisters to whip Bit Cloud and his friends. The second time, it did not go so well for the Lightning Team. Fool me once, shame on me. Fool me twice, shame on you. Never use the same tactic twice on the same opponent, readers. And definitely do not pull the same trick in the same battle more than once! This entry was posted in Spotlight!, TV Shows and tagged Bit Cloud, Blade Liger, children's animated tv shows, Command Wolf, Favorite Zoids, Guylos Empire, Helic Republic, Irvine, Japan, Japanese Anime, Japanese cartoons, Japanese dragons, Liger Zero, ligers, Lightning Saix, Spotlight!, Storm Sworder, The Blade Liger, The Lightning Saix, TV series, TV Shows, Zoid Battle Commission, Zoids, Zoids: Chaotic Century, Zoids: Fuzors, Zoids: Genesis, Zoids: New Century Zero on May 26, 2016 by The Mithril Guardian. Ready for a fight, readers? Then you have come to the right desert! Today we are once again on Zi, studying one of the zoids which lives there. This zoid is the Iron Kong Mark II. The Iron Kong Mark II is the only Iron Kong model with which I am familiar. It is the Imperial equivalent of the Helic Republic’s Gojulas. Like the Gojulas, the Iron Kong is a zoid whose basic function is that of a tank. However, Iron Kongs are far more maneuverable than Gojulases. 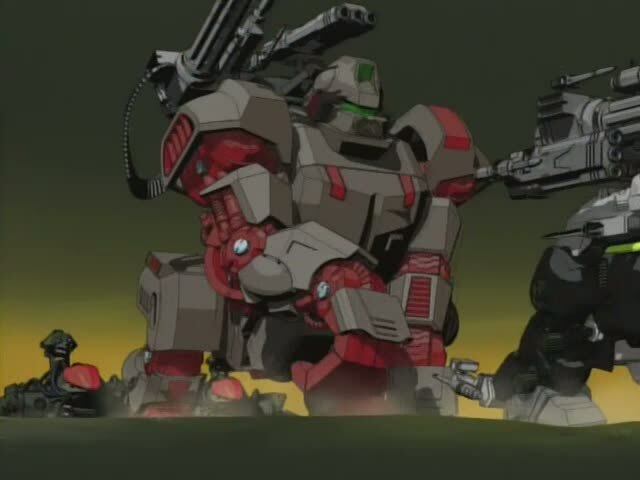 Even on a bad day, I would take an Iron Kong over a Gojulas, for the simple reason that this zoid is more maneuverable than the Tyrannosaur-type Helic tank. Iron Kongs are gorilla-type zoids. The cockpit for an Iron Kong is in its head, behind that green glass which serves as the zoid’s eyes. The cockpit is usually made for one pilot, but some Iron Kongs are two-seaters – these cockpits are far more spacious than cockpits for single pilots. I imagine it is not hard to modify an Iron Kong’s cockpit either way. Though they are heavily armored, Iron Kongs are fairly dexterous and nimble zoids – up close, anyway. Over long distances, they are slow moving. Iron Kongs are extremely strong, some of the strongest zoids on Zi. Even without their artillery, an Iron Kong is a ferocious zoid. Someone going up against an Iron Kong had better be prepared to take a pounding. Ace zoid pilots may, with luck and/or spectacular skill, walk away from a battle with an Iron Kong unscathed…. But pit an Iron Kong pilot who knows what he is doing against an equally skilled pilot controlling another zoid, and you have a recipe for an amazing battle! As I said, the Iron Kong is slow over long distances. But in close combat, their bulk is no hindrance. And this makes them very deadly. Most Iron Kong pilots’ first instinct is to pull the trigger when they are attacked. Despite sitting on a virtual mountain of muscle, their immediate reaction is to go for their guns. (Insert eye-roll here.) I do not know why they do this, but it happens all the time! The Iron Kong, because it is a strong zoid, can be loaded up with several different weapons and remain highly maneuverable. These armaments range from anti-zoid cannons to machine guns to missile launchers hidden in the zoid’s shoulders. And, just like a real gorilla, an Iron Kong could physically rip an opposing zoid apart. I have never seen it happen, exactly, but a couple of pilots from Zoids: Chaotic Century have shown just what the Kongs are capable of in close combat. Iron Kongs are generally as expressive in battle as other zoids. All zoids make sounds like the animals they are based on and, as living beings, they have attitudes and emotions they express through sound. Ligers and Zabers can both “purr,” while Command Wolves have been shown to growl affectionately toward their pilots. I would not want to tangle with an Iron Kong pilot who knew what he was doing. If I had to fight him, that would be one thing. But choosing to fight him..?! Thanks. I will pass. The Iron Kong’s armor is second to none. Only machine guns or other such weapons fired at close range can bring a Kong down. Most guns, fired at a distance, barely put a dent in the armor. However, this hardly makes the Iron Kong an invulnerable zoid. There are weapons capable of wiping out Iron Kongs (and most other zoids) at a distance. But I am saving those for another day. Eventually, I will explain the matter further. 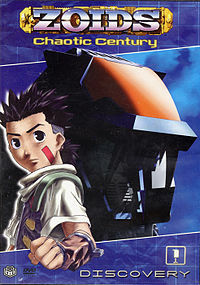 Of course, if you were to look up Zoids: Chaotic Century on your own, readers, you would get the answers much faster. Failing that, I must request that you bear with my descriptions and promises with as much patience as you can muster. My overall rating for the Iron Kong is that it is a heavy artillery zoid which, with a capable pilot, can be deadly in close quarters. Only great pilots such as Chaotic Century’s Colonel Karl Shubaltz and former Imperial soldier Rosso have shown what an Iron Kong can do with a competent pilot. I have never forgotten their lessons. The Iron Kong is not revered as the Gojulas is in Chaotic Century. I, however, have a very healthy respect for this zoid. Better with me than against me, that is for sure! This entry was posted in Spotlight! and tagged Colonel Karl Schubaltz, Command Wolf, Gojulas, gorilla, gorillas, Guylos Empire, Helic Republic, Iron Kong Mark II, Japan, Japanese Anime, Japanese cartoons, King Kong, ligers, Rosso, Spotlight!, tank, tanks, The Gojulas, The Zaber Fang, Zaber Fang, Zoids, Zoids: Chaotic Century, Zoids: Fuzors, Zoids: Genesis, Zoids: New Century Zero on February 16, 2016 by The Mithril Guardian. Here’s Spotlight! Today’s focus is on yet another zoid from the series Zoids: Chaotic Century. 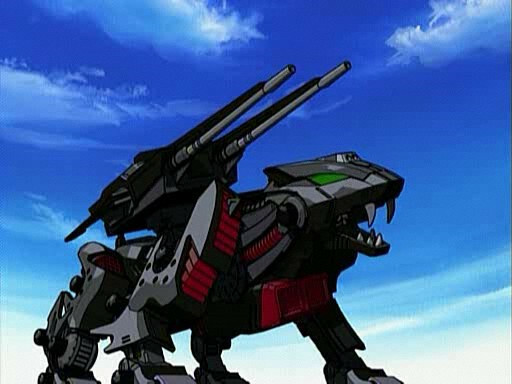 This zoid is the Shield Liger – a zoid designed and built by the Helic Republic to counter the Guylos Empire’s Zaber Fang. Although the zoid is referred to as a Liger, which is the offspring of a male lion and female tiger, the Shield Liger is based solely on the lion. Unlike the Zaber Fang, the Shield Liger has a larger cockpit and can seat two people, one to pilot the zoid and the other to “fly RIO,” or act as a sort of Radar Intercept Officer. During the first half of Chaotic Century, the Helic Republic and the Guylos Empire were locked in a fierce war (we never learn exactly what began the war, and some of us are not particularly inclined to care why it started). The Republic was fighting for its survival as a nation and, being the underdog in the war, its weapons were not of the same quality as the Empire’s. One character in the series, Moonbay, continually scorned the quality of Republican-made goods, particularly its ammunition. Since the Empire had more wealth, it could afford better gear and weaponry for its soldiers, while the Republic had to make do with what it could build from scratch or buy from others. Undoubtedly, some of these merchants who sold the Republic goods for its war effort offered them technology that was substandard. Building stuff from scratch also means that some of the Republic’s equipment would not function well, and at times it was known to give out in the worst possible situations. The Shield Liger is a zoid which is not quite as lithe as a Zaber Fang, but it is a high performance and maneuverable zoid nonetheless. Because the Republic had less wealth than the Empire, they had to make the most of the weapons they had. So the Shield Liger, unlike the Zaber Fang, comes equipped with two eight shot missile launchers that are folded against its sides when it is not in combat. When in a battle these missile launchers can be lowered and used to fire missiles at an enemy zoid (the above photo showcases the Shield Liger’s left missile launcher in action). The only problem with the launchers is that they can only carry so many missiles. Not only that, the Shield Liger must remain still while it fires its missiles, making it vulnerable to attack if it is still firing at a rapidly approaching target (this was never seen in any series that I know of, but it is a possibility I have thought about). 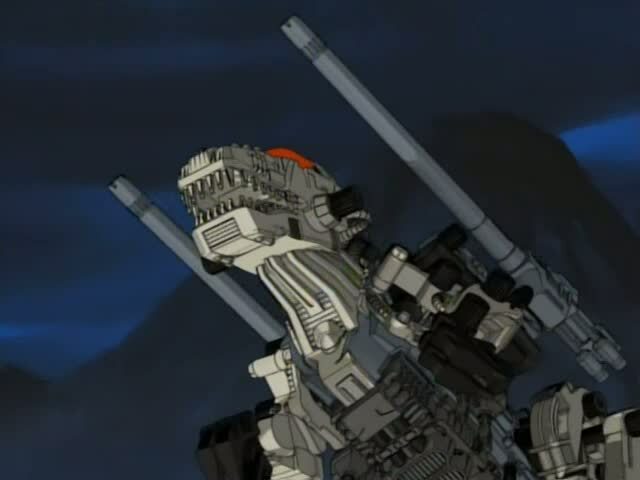 Also, if a particularly ruthless enemy pilot wanted to severely damage a Shield Liger, they could snap off one or both of the launchers when these were lowered (this was never shown in any zoids series that I can recall, but it was another prospect I considered). The Republicans, ever practical with their limited supplies, also installed a two barrel cannon (it may have been a laser cannon, I never learned for sure) beneath a panel of armor on the zoid’s back. This panel is not shown in either of the attached photos, unfortunately. This cannon would be an asset it close combat, because the Shield Liger pilot could extend the cannon and fire broadside at a rival zoid if it could get close enough. The three barrel cannon between the Shield Liger’s forelegs is another weapon that could be used to great effect in combat (the Zaber Fang, too, traditionally comes equipped with a similar cannon between its forelegs). Perhaps the Shield Liger’s most impressive weapon is its energy shield (hence the name Shield Liger). Though it is not shown in either of the attached photos, the shield is a dome of white energy that is activated when a plate of armor under the zoid’s chin flips down at a roughly seventy degree angle and another plate of armor behind the cockpit flips up at the same position. This activates the Shield Liger’s energy shield, which covers the front half of the zoid. The shield can be used defensively to protect the zoid from enemy fire, but it can also be used offensively. Ramming another zoid while the Liger has its shield engaged can either damage the other zoid or it can knock the opposing zoid down. But while the shield is a great asset and can block most conventional fire, a heavy duty enemy shell, a ram attack by another zoid, or a heavy bombardment can tax the zoid’s energy reserves to the point where the zoid cannot keep the shield up. Once the shield is down, the zoid is again conventionally vulnerable. The shield can also be pierced by another zoid’s attack, not just enemy shells. Raven was able to penetrate the shield of Van’s Shield Liger with his Zaber Fang (Van is the protagonist of Chaotic Century). The maneuver destroyed Raven’s Zaber Fang but it also broke through the Liger’s shield. And there are zoids with capabilities that can destroy a Shield Liger very easily, but those will be discussed another day. I have always had a preference for the Shield Liger, even when other, stronger zoids stepped onto the scene. It is a strong zoid when paired with a capable pilot, and I think that, if zoids were real, I would choose to pilot a Shield Liger. But that right now is a dream that has yet to see any chance of fruition. Still, it’s fun to have a dream like this, I think. This entry was posted in and Laughs, Giggles, Grins, Spotlight!, TV Shows and tagged "flying RIO", Guylos Empire, Helic Republic, Japanese Anime, Raven, Shield Liger, The Shield Liger, TV Shows, Van Flyheight, Zi, Zoids: Chaotic Century on October 5, 2014 by The Mithril Guardian. Welcome to Spotlight! 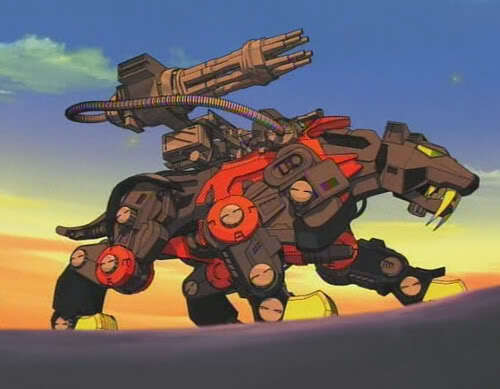 Well, readers, here I am again, this time showcasing another zoid from the animated Japanese series Zoids: Chaotic Century. 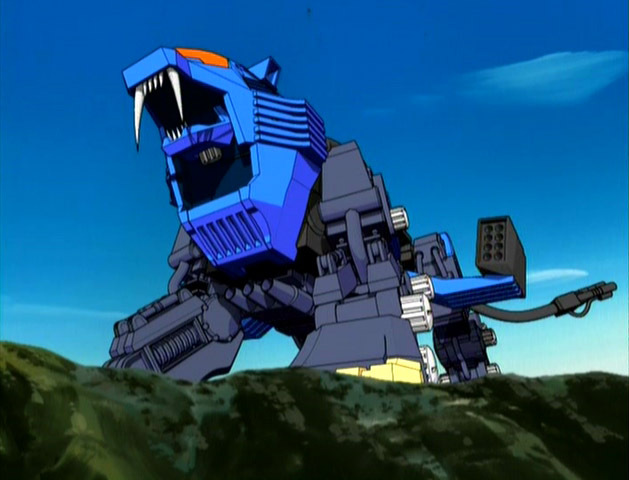 The photo above is a still shot of a Zaber Fang (sometimes referred to in Chaotic Century and other series as a Sabre Tiger, Sabre Fang, or Zaber Tiger; Zaber Fang, however, is the more common name for the zoid). The cockpit on the Zaber Fang is in its head, beneath those glowing green eyes. The Zaber Fang, quite obviously, is designed after a Saber-tooth tiger. It is a common ‘cavalry’ zoid in Chaotic Century’s Gulyos Empire’s army. The zoid is agile, and fearsome. The Chaotic Century antagonist, Raven, was first introduced to the audience piloting a lightly armed blood-red Zaber Fang. Raven, whose expertise with a zoid in combat is equivalent to the Winter Soldier’s proficiency as an assassin and hand-to-hand fighter, was shown to utilize his Zaber’s capabilities in unorthodox and brutal ways. I can never look at a Zaber Fang, no matter which character is piloting it, without remembering his vicious attack style, which he never abandoned even after he lost his Zaber. It was Raven’s wicked fighting skills that jolted me to the realization that battles are not won on strength and firepower alone. For this reason, although I despised Raven for a long time, I always respected and liked the Zaber Fang. While it is not the fastest ground zoid, the Zaber is fast. It is dexterous and lithe, making it a perfect zoid for close combat situations, which Raven always favored. The armaments on the Zaber Fang can easily be rearranged or removed; the machine gun on the Zaber Fang in the above photo could be detached and a larger or smaller gun put in its place. Other Zaber Fangs in the series even came with “flying gear” – attachments that aided the zoids and their pilots in leaping high over a rival zoid or enemy fire. This also allowed particularly skilled pilots to pounce on and demolish enemy zoids. For some reason a great many pilots in most Zoids’ series never seemed to learn to do anything other than pull the trigger on their zoids’ guns. Yes, a few pilots might have been scared so badly that they stopped thinking and kept their fingers on the triggers, but this is a no less pardonable offense than the first error. Freezing up in a battle, mentally or physically, results in the fighter becoming very, very dead far too quickly. Of course, the fact that the Zaber can carry whatever weapons will fit on it and not bring it to its knees can also be a problem. Throw too much weaponry on the Zaber’s back and its speed, agility, and all-around maneuverability becomes lethally inhibited. As a result of watching Chaotic Century, I have little patience for characters who cover their machines – zoids or otherwise – with nothing but weapons. The extra weight can be awkward and a burden; this is not what a fighter needs in the middle of a firefight or melee. You can thank Raven for my opinion on this one. All in all, the Zaber Fang is a capable zoid for almost any situation. It is, however, especially good for close combat. And that is where I would use it the most. This entry was posted in and Laughs, Giggles, Grins, Spotlight!, TV Shows and tagged Guylos Empire, Helic Republic, The Zaber Fang, TV Shows, Zi, Zoids: Chaotic Century on September 24, 2014 by The Mithril Guardian. If you have kept up with my blog so far, then you know that one of my favorite animated television series is the Japanese show Zoids: Chaotic Century. I grew up on this show and – just like many people who grew up with a story and enjoyed it immensely – Chaotic Century is special to me. But there is more than mere nostalgia in my appreciation for the series. Chaotic Century was the first television show which drove home to me the fact that battle – or fighting of any kind – is not always best accomplished by continual punching. Prior to viewing Chaotic Century, my only impression of fight scenes was a great deal of motion which, to my childish eyes, seemed to focus a great deal on punching an opponent. I saw no tactics or strategy involved in fight scenes, only continual motion. So it was that I was rather rudely awakened to the fact that fighting does require a modicum of thought to be effective. While watching episodes of Chaotic Century, I learned that pure muscle and energy could certainly aid someone in a fight, but that there were other factors involved in battle as well. Factors such as maneuverability, speed, and dexterity became more important as I followed the story presented in Zoids: Chaotic Century. The lesson was perhaps learned a bit too well. To this day I avidly watch fight scenes in movies and television shows, scrutinizing the actors’ choreographed maneuvers in an attempt to follow the fighting to predict how the battle will fall out. It is for this reason that Chaotic Century has held my interest for the length of time it has. So today I am launching a new type of post called Spotlight! These posts will be quick, simple pieces of writing discussing my opinions on something, usually a character, a scene, or – wait for it – a zoid. The reason I include zoids in these posts is because there is so little written on WordPress about any series of Zoids that I cannot help wanting to fill the void. Whether or not anyone reads these zoids posts, I will be having fun, so who cares? The first zoid on the block is the Gojulas (pronounced go – ju [as in ‘judo’] – lass). Based on a Tyrannosaurus Rex, this zoid can be a holy terror on the battlefield. In Chaotic Century the Gojulas is used primarily by soldiers of the Helic Republic. The Gojulas has dense armor, which is not easily pierced, and two large cannons set on its back, making it the equivalent of a very tall, solid tank. And do not let the above photo fool you – the cannons may appear flimsy but they can shoot shells that will utterly destroy almost any opposing zoid. Some Gojulases come equipped with two pairs of small laser cannons on their torsos, but I do not believe that the above Gojulas does. The Gojulas is considered by many zoid pilots (that orange dome on the Gojulas’ head is actually the canopy for the pilot’s cockpit) to be the ultimate combat machine. And the respect they show throughout the series to the Gojulas is well earned. With the cannons on its back, the Gojulas can generally take out almost every antagonist before it can get close enough to do any damage to the Gojulas, making it a nigh impossible target to destroy. But the Gojulas does have its limitations. First and foremost among these is the heavy armor on the zoid. The armor protects it from serious damage most of the time; simply shooting at a Gojulas until one runs out of ammunition is ill-advised indeed. I have watched them take heavy fire and shrug it off like rain. However, the heaviness of the Gojulas’ armor means that its maneuverability is severely restricted. 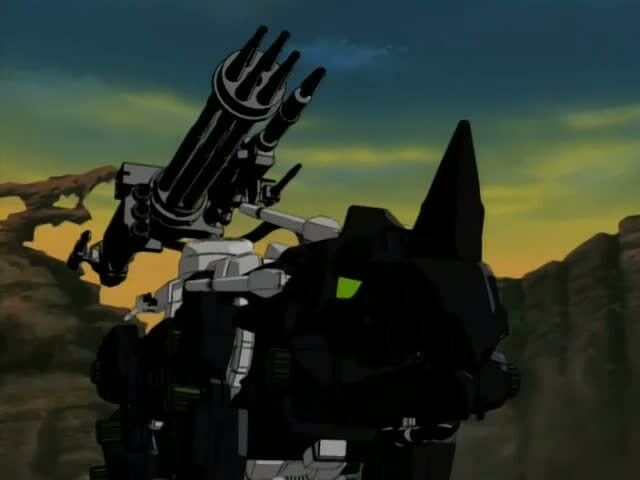 If enough opponents can get close enough to the Gojulas, the zoid’s cannons will be useless in protecting it, since they are meant to fire at long range targets and not enemies sitting directly under the Gojulas’ snout. Also, more powerful zoids can easily destroy the Gojulas from a distance. The laser cannons some Gojulases are equipped with are rather small, and so they would not be terribly effective against a multitude of zoids at close range. And the more nimble the hostile zoid, the more the likelihood of the Gojulas being unable to target it long enough to destroy it, since its bulk lowers its range of movement significantly. Also, the Gojulas has to keep its balance or it will tip over and land on the ground (that is what occurred in the episode the above photo came from). So the Gojulas has to be positioned on level ground that will not give way beneath its weight. Cocky pilots who try to push the zoid faster than it can go or who are not paying attention to their surroundings can – and have – grounded Gojulases in their conceit. Despite these drawbacks, the Gojulas is a truly impressive combat zoid. I would be more inclined to use it as a fixed weapon or to plod it toward – and through – enemy ranks than to use it in melee combat. But I suppose that a skilled pilot could wade into a melee in a Gojulas and win the fight. That skilled pilot, however, would very likely not be me! This entry was posted in and Laughs, Giggles, Grins, Spotlight!, TV Shows and tagged Guylos Empire, Helic Repulic, Japanese Anime, The Gojulas, TV Shows, Zoids: Chaotic Century on September 12, 2014 by The Mithril Guardian.